Just as teachers and parents want students to keep learning, administrators want teachers to keep improving. Here’s a look at how schools and districts make it easy for teachers to continue their learning. A look at the new PLP. Challenge: Like many states and districts, the New Mexico Public Education Department needed to figure out how to ensure that every teacher received in-depth professional development to close the achievement gap, implement Common Core instruction and assessments, differentiate instruction, and elevate coaching and instructional leadership. The challenge was providing such in-depth PD effectively statewide. Solution: The district chose Knowledge Delivery Systems’ (KDS) strategic PD solution to tackle this challenge. Courses will be delivered via KDS’s Professional Learning Platform (PLP). 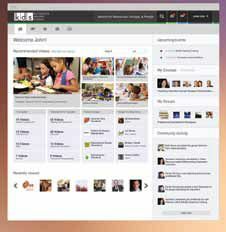 PLP is a new cloud-based platform that gives school districts access to rich, curated content, social collaboration tools for collegial learning, and personalization based on district, building, and individual goals that adapts over time. Whether they are accessing on-demand videos, interacting with other educators, or leveraging KDS’s expert-led online PD courses, districts in New Mexico will be able to use PLP to transform teaching practice and support the professional growth of their educators. Challenge: In 2013, Des Plains (IL) Consolidated School District 62 created an ambitious plan to increase use of digital devices and content in K-12 classrooms over a three-year period. But first, it needed to find a way to build the capacity of its teacher leaders to integrate digital content into instruction and prepare students to be globally competitive, 21st-century learners. Solution: The district expanded its partnership with Discovery Education to allow teachers to participate in the company’s brand-new Digital Leader Corps (DLC), a multi-year PD program that helps teachers build a network in which they can design, implement, and share innovative teaching strategies. Through DLC, District 62 teacher leaders will learn strategies for integrating educational technologies and digital media into classroom instruction. The DLC program provides teachers with customized consultation throughout the process, with modeling, coaching, and feedback from Discovery Education advisors. “To truly transform teaching and learning, and ensure a successful digital transition, our teachers need a supportive environment where they can continuously improve their skills, knowledge, and instructional practices,” says Jane Westerhold, superintendent. Challenge: The Coatesville (PA) Area School District needed to provide professional development training for 100 administrators, teachers, and consultants to build educator capacity and realign Coatesville’s curriculum with the Pennsylvania Core Standards. Challenge: The Eatontown (NJ) Public School was striving to create a cycle of continuous improvement of instructional practices for all of its educators. The district needed to find technology to conduct and manage teacher and principal evaluation processes, to better identify educators’ strengths and development areas, and to share instructional best practices district-wide. They were also looking for better ways to discuss classroom instruction in more meaningful ways and to engage in ongoing, collaborative professional development. Solution: Eatontown implemented three programs: Teachscape’s Reflect Observation and Evaluation Management System. Charlotte Danielson’s Framework for Teaching for teacher evaluations, and the Multidimensional Principal Performance Rubric for principal evaluations. Since the evaluations are being conducted at both the teacher and administrative level, the evaluation process has fostered a shared sense of responsibility and collective focus on professional growth across the district. Teachers and administrators now use a common language when planning how to improve student learning and achievement. “With Teachscape’s Reflect system, we can meaningfully and purposefully use data to inform professional practice at both the teacher and principal levels,” says Scott T. McCue, superintendent. Clear Lake students work on their #DifferenceMakers project. Everyone knows it’s a struggle to change a school’s culture, but that’s what’s been happening at Clear Lake Middle School, a 1:1 iPad school in Clear Lake, Iowa. During the last four years, teachers have worked to incorporate the AIW (Authentic Intellectual Work; www.centerforaiw.com) framework into their practice. Last year, when Principal Steve Kwikkel came on board, he wanted teachers to choose something they were passionate about so they could engage students in real-world problem-based learning (PBL). Since turning into a PBL school isn’t a small endeavor, Kwikkel created time for teachers to collaborate in professional learning communities (PLCs). Every Wednesday afternoon for much of the last school year, the sixth-eighth-grade teachers figured out how to combine AIW into PBL. Indian River teachers funded Chromebooks through an online wish list. After teaching more than 150 staff workshops, I have found that certain techniques will produce a successful program. The first step is obvious: Staff members must have ownership in what is being offered for district members. Just as educators try to design their lessons to fit their students’ needs, a PD instructor needs to know the staff’s needs and concerns to design a successful workshop or in-service. • Will the topic serve all the teachers? • Will this topic be interesting for the majority of the staff? • Is this something teachers can use immediately in the classroom? • Will it motivate staff? • Will the training involve hands-on and interactive activities? • Will there be follow-up after the training? If so, how will the follow-up be communicated? • Will college credit be available? Teachers read QR codes on their iPads to complete a scavenger hunt. Survey your staff. Create a Google Survey to gather input on topics staff would like addressed during PD activities. Be sure to use multiple-choice and short-answer questions in the survey. Use the data to share with the PD committee and to design the workshops. Design the workshop according to staff needs and suggestions. Be sure to clearly discuss how the PD activities will prepare the staff to use what they learn with students in the classroom. Hire staff members. Review the collected data and list staff members that could do the training or offer assistance. Make it interactive. Provide time during the PD activity to develop classroom lessons. Use Google Drive to share the lessons and handouts and to collaborate on items during and after the workshops. Offer refreshments. Snacks are greatly appreciated! Keep attendees in the loop. After each workshop or PD activity, email an update to all staff members in attendance. Be sure to include a list of questions and answers to topics discussed. Publicize your efforts. Take pictures of staff working during the workshops. Post the pictures on the school Web site or in the district newsletter, or send to the local newspaper. Offer credit. Create a relationship with an area university to offer semester hours for attending a series of workshops. Michelle Vance has 25 years of experience working with K-12 tech integration as a computer science teacher and director of technology. She has taught and designed more than 150 staff technology workshops and was a former Tech & Learning Teacher of the Year for Ohio. After learning that only 50 percent of its teachers were satisfied with their PD, Liberty High School in Eldersburg, Md., spend two years restructuring its professional learning program. Today, staff satisfaction is at an enviable 99 percent. Here’s what they did. Step 1: Reflect & retool. Staff members gave written feedback on the PD, calling it outdated, irrelevant, and not individualized. During the next two years, staff members and administrators figured out how to turn it into engaging, relevant, and collaborative opportunities for professional learning. Step 2: Fix broken pieces. When a Liberty teacher said she could learn what she missed at the monthly, hour-long faculty meeting in three minutes, administrators reduced the amount of whole-faculty meetings and included time for staff to share and collaborate. They also used the time for departments to collaborate on instruction. Step 3: Promote collaboration and autonomy. To develop an atmosphere based on collaboration, the school used the former faculty meetings for newly formed professional learning communities (PLCs). The groups meet monthly to find new ways to share ideas and incorporate new ideas in their classrooms. Step 4: Find additional ways to share best practices. Inspired by the concept that many best practices can be shared, reviewed, and discussed in 10 minutes, staff members gather twice a month for Ten-Minute Tuesdays to learn about a tool, a practice, or an initiative. The sessions, based on staff requests, are voluntary, and have focused on Edmodo, BrainPOP, and Discovery Education. Step 6: Continue providing innovative learning opportunities. One afternoon in March, the school held its first FedEx Day, based on a concept from Daniel Pink’s Drive, when which businesses give employees a day to work on projects and share their outcomes at the end of the day. Teams of Liberty faculty members worked on developing a direct instructional program for special education students, integrating infographics into classroom assessment, and more. FedEx Day was so successful that it will be a full-day activity for teachers next year, with a potential student FedEx Day as well. These steps were taken from “Forget Faculty Meetings…Focus on Professional Learning,” an article published in the March 2014 issue of NASSP’s Principal Leadership.